Morning, it’s all smiles at Capitol Spine & Rehabilitation! Come get your nervous system powered up with chiropractic treatment! Address your carpal tunnel and/ or wrist concerns at Capitol Spine & Rehabilitation. Tell the Bells and ask how we can help your joint and muscle pains and/ or pinched nerve. 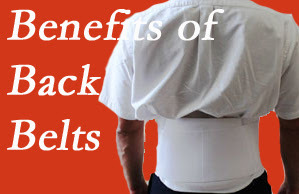 Low back pain patients may benefit from wearing a lumbar support belt. New research shows that a lumbar support belt doesn’t necessarily cause muscle weakness but rather improves walking distance ability for spinal stenosis patients with intermittent claudication, reduces pain and fear of pain, decreases use of pain medications, and increases muscle strength, flexibility, and activities of daily living. (3-10) All good! Your chiropractor carefully considers the use of back braces for back pain patients as they heal knowing the benefits back braces may provide. Please share this information with your friends and family who may benefit! Now is the time for chiropractic! Lancet, one of the leading medical journals, presented a series of articles on the sad state that healthcare systems around the globe are managing low back pain. Back pain is a huge problem everywhere and getting worse. 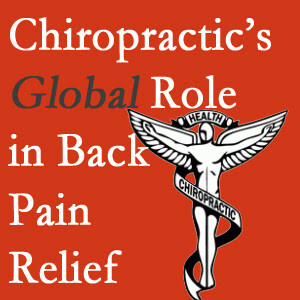 And chiropractic is “perfectly placed to be a major player in providing a part of the solution to the global challenge of low back” as long as its providers follow guidelines (like we strives to do!) to not order too many x-rays, follow evidence-based care clinical practice guidelines, and keep abreast of the latest research (and even participating in research when possible!). Chiropractic is recognized for its role in caring for back pain. It is working its way into mainstream healthcare to help more back pain and neck pain sufferers non-pharmacologically and non-surgically. (1) The World Federation of Chiropractic is developing toolkits for chiropractors to engage with public health communities and be of greater service to patients and communities within the health system as valued partners for their health and well-being. (2) We appreciates this support and vision from a world chiropractic organization as that is just what this chiropractic practice strives to do here in our community. Morning, it is a great day to have your student athletes’ spines checked at Capitol Spine & Rehabilitation. An optimized nervous system, posture, balance, and strength are essential in them succeeding on the field or court and in the classroom.